Entries in the franken polish contest are now closed. A week or so a go, I created a blue magnetic holographic franken polish. Today I have created a black version. I LOVE it. This was 1/2 magnetic black polish, 1/4 China Glaze Let's do it in 3D and 1/4 Glitter Gal Black Holographic. I've named it 'Magnetwinkle'. I really love creating franken polishes, it’s relaxing, creative and easy to do. So I have decided to do a franken polish contest, just to see what beauties you can all come up with. You have to be a GFC follower to submit your entry. You can submit just one entry. 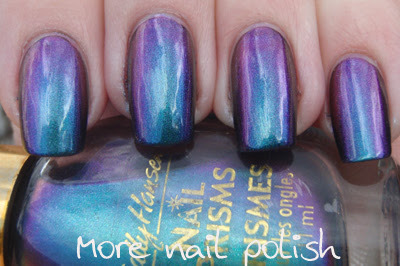 You must create a franken polish, name it and swatch it on your fingers. Your franken can be created anyway, mxing poilshes or adding micas, pigments and glitters. your blog URL – if you have one. any other description or comments to support your franken polish. Your entry CANNOT be posted anywhere until I publish all entries here, after that you can go nuts and post your pictures anywhere and ask for votes. Entries close in two weeks, on 2 June 2011, so get your lab coats on and start frankening. The winner will be determined via online voting, where each of my GFC followers will be able to vote once for their favourite franken polish. The winner will receive a brand new, unused bottle of the discontinued and hard to find, Sally Hansen Nail Prisms Turquoise Opal, purchased by me. Here is a swatch of my bottle, I'm giving away my spare. WHY did i have to make/post the best franken ever a few days ago?! hahahaha. thanks for this contest! i looove turquoise opal! That is a fantastic franken. How do you get so good a mixing colours that worked. Mine are all fails. Gorgeous!! Where did you get the black magnetic polish you mixed in? Oh I hope you guys all enter, I can't wait to see what you create. @liz - you have to try it out, its really quite easy to create a franken. My first ones were simple mixed of creams and they were some of the nicest I created. @Yasmin - Give it a go, its really fun. And you should definitely enter whatever you create. @rebecca - that was a great franken you created. Good luck creating another knockout. @Cat - I feel like doing a franken fail contest too, so people can submit their failed frankens and we all vote on the biggest disaster. I know I have a few pretty bad ones. @Ice queen - looking forward to seeing your creation. Yuor very paitent to wait to finish them off, I can't wait to finish to try it on. @Ngelic - you don't have to have fancy ingredients create something awesome, some of my best have been cream mixes. I hope you give it a go. 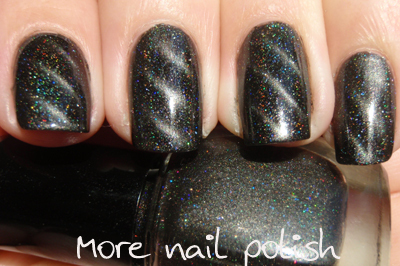 @melissa birch - I bought the magnetic polishes from http://www.nailart-und-mehr.de/. Ooh, this should be fun! I'll have to go through the frankens I haven't posted and see if I want to use one of those or make a new one. Can I still send my entry today? Hey! What a fun contest! I submitted my entry tonight :) Did you receive it? I can submit up until 11:59PM on June 2nd? or is it until 11:59 on the 1st? It's still open Janna- until 11:59PM on the 2nd, anywhere in the world.